I always try to buy piggy’s with a certain known provenance. I don’t need any more question marks in my collection. But there are always exceptions. As for this old fashioned piggy bank. I bought it not knowing anything about it, besides the colour and the length (25 cm). 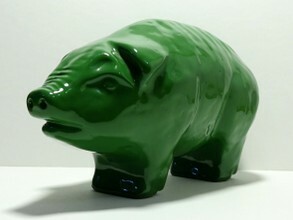 The seller: “I sell this piggy for an old lady I care for.” Information that does not help to identify it. Sadly it’s all I have. Is there anyone who can help me identify it?